Can I just say that this was pretty much one of the most awesome things I've ever done? 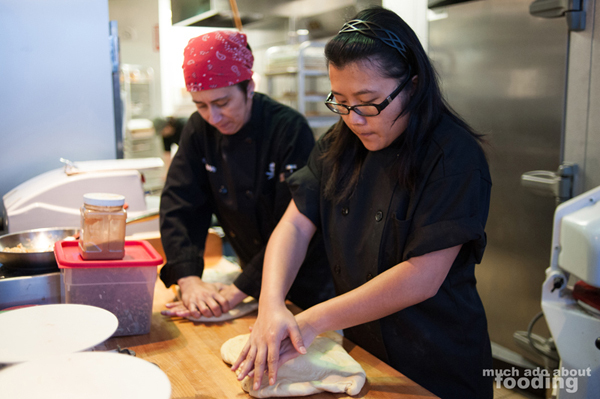 I thank Chef Rachel at Blackmarket Bakery for giving me the opportunity to work with her and her crew one morning in their prep for the day. 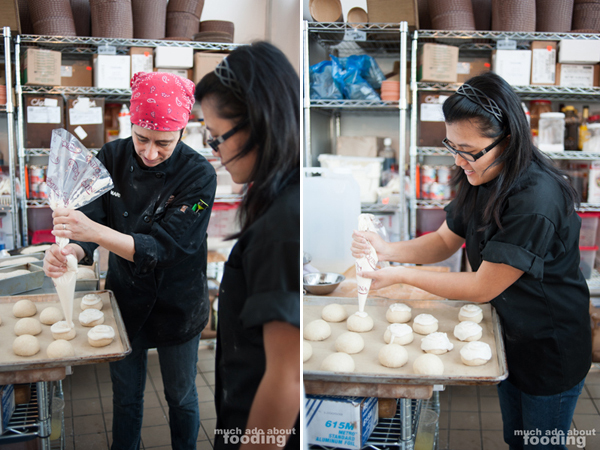 I was so excited when she invited me to play with bread dough since I haven't done so before. I mean, for a first time with the dough, I got to work in a commercial bakery set up? How spoiled! Anyhow, so Duc and I (haha, yes, he got dragged into it) got to the location at The Camp at 5 in the morning when it was still dark out. 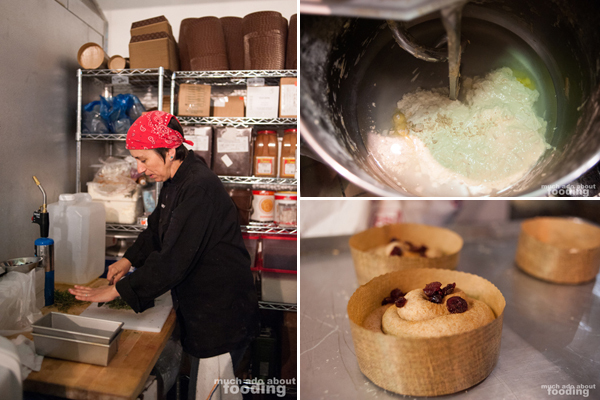 Despite us feeling like it was super early in the morning, the bakery was already bustling. There are always people there 24/7 working on baking things either for the retail places they deliver to or for the shop itself during normal business hours. 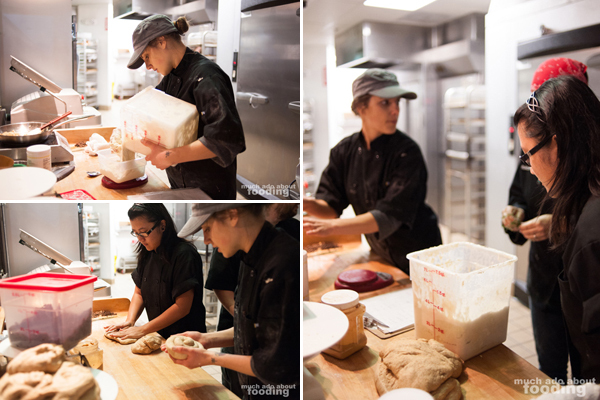 Chef had a lot of different recipes that she wanted me to work on with her and her staff but the first instructions rested with how exactly to tell when good dough is good dough. 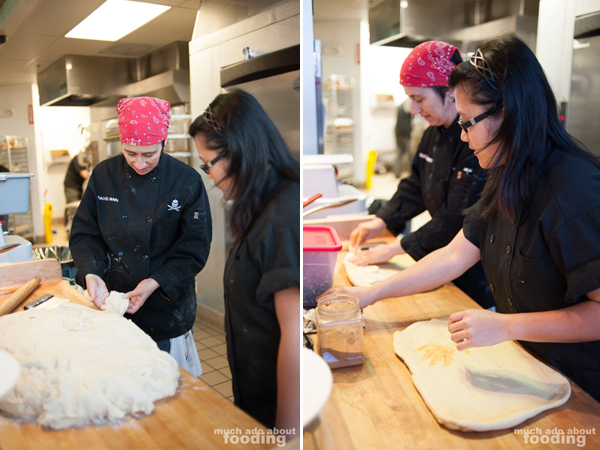 We stretched and played with some of the different doughs there, seeing the various textures that the separate ingredients created. 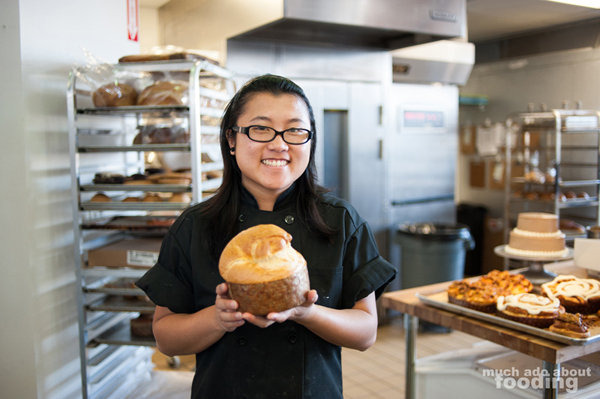 What was interesting was that while I've always avoided too much baking because it always seemed like an exact science to me, one thing that she often said about her recipes and baking is that the doughs are "very forgiving." I hope they will be to me in the future when I try my hand at making my own bread! I had to include an assortment of pictures that might not all make sense but they were the easiest summaries I could make of that morning. All ingredients were meticulously measured there down to the ounce to make sure that all we were working on was going to turn out just the same; it makes a difference to the customers for sure! I won't give out any secrets I learned that day on what ingredients were used and how much of each but I will say that I was very impressed with the levels of flavor complexity that can be created from such a short list of ingredients. 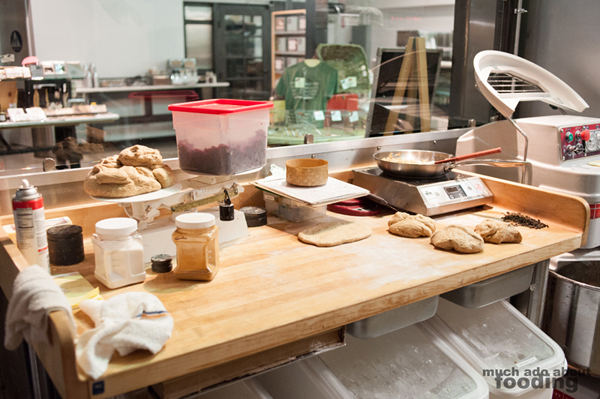 I love how Blackmarket Bakery uses the pure ingredients themselves rather than rely on any substitutes or artificial ingredients. 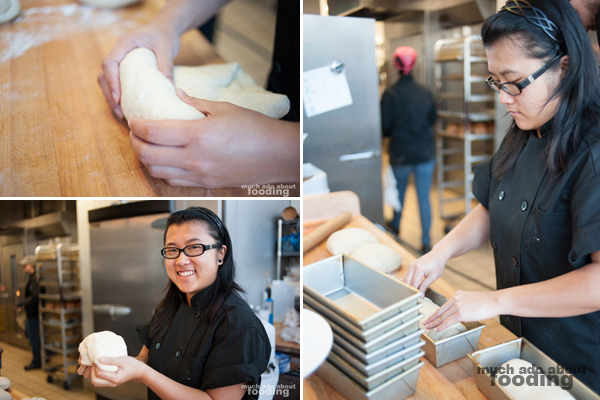 They even used fresh yeast in their dough! 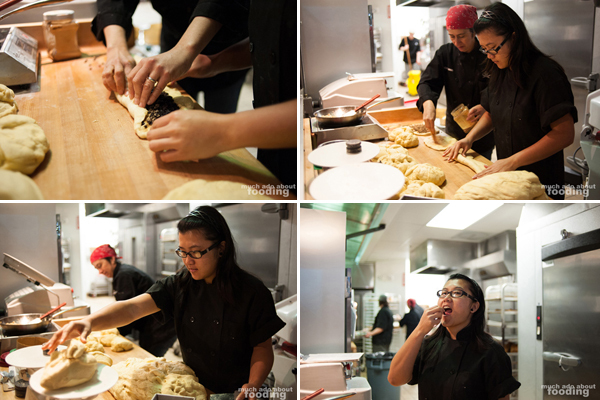 I had a good time learning how to shape some of the rolls too and brushing on heavy cream on their croissants. 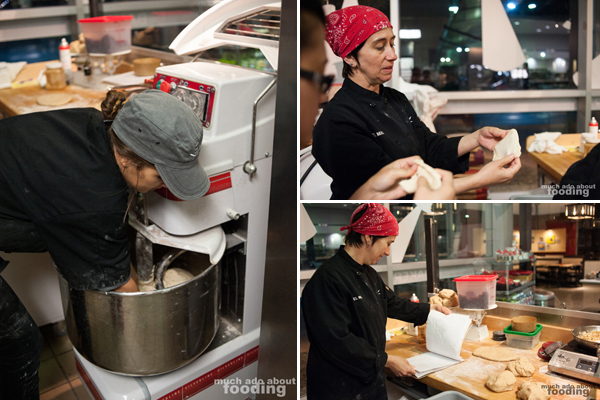 Chef had mentioned to me that she really believed in muscle memory when it comes to baking, and I definitely understand once I got a feel for what I was doing. I just ended up figuring out how precisely to roll, press, beat, etc everything a certain way to get the desired effect. I'd say I learned a lot in this "morning internship," as I'll call it. We made a lot of bread! 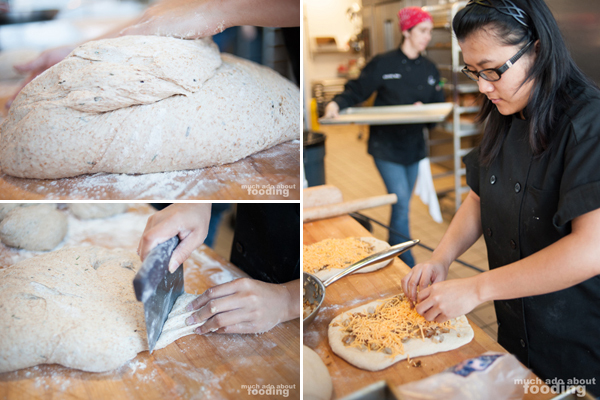 I got to try my hand at making their Dutch Crunch Bread, Lemon Rosemarty Sourdough, and even the Cheddar Scallion Loaf. 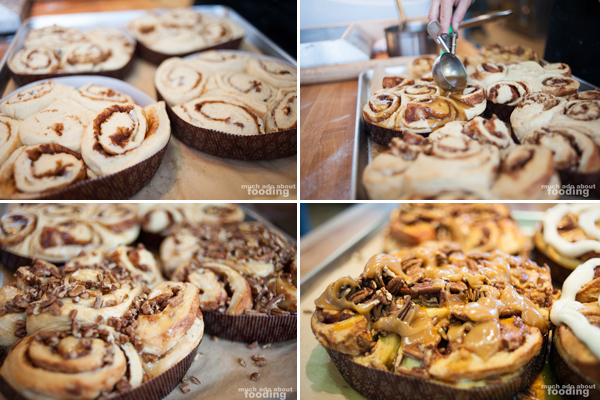 I even rolled cinnamon rolls and sticky buns. Again, it was quite amazing the goodness that came out of just a few basic moves and ingredients. I think that's what really draws me into cooking and baking - that marrying of technique & flavors that creates a cultural experience like no other. Something that I've always been surprised about whenever I bake and was once again surprised about was the amount of butter used in a lot of the things we know and love. I guess it does make it taste as good as it does. As Chef Rachel did say though, there were no vegan cavemen! Fat satisfies our tastebuds for sure. I even got to solo a few loaves of my own. I hope that whoever got ahold of them enjoyed them. I don't think they turned out TOO badly, haha. 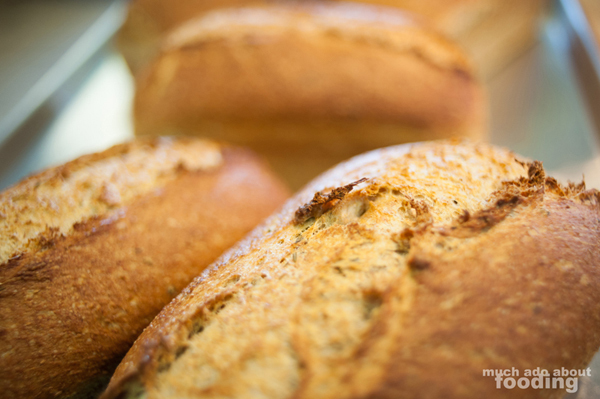 What was fascinating to me of everything we made was the effect that the Dutch Crunch topping made on the rolls and bread after they baked. It pretty much looked like the bread had cracked through but it was actually the topping that gave it an effect. If you need an example, go check out their rolls and bread the next time you're in! I think in general, everything turned out quite well and hopefully I was a good pupil. I definitely don't remember all of the ingredients that went into everything but that's just part of the magic. 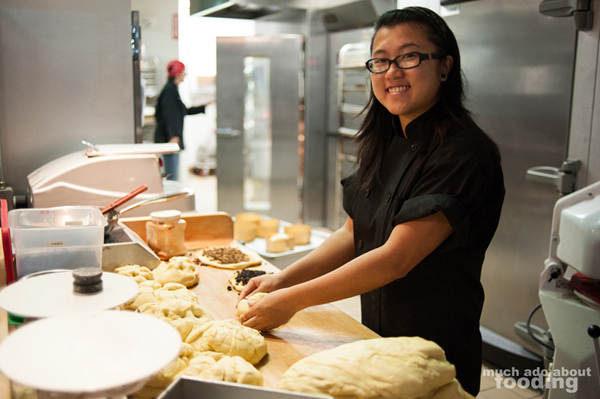 It's also part of learning and being the creative mind that puts a favorite bakery together. Duc had actually taken 100+ pictures of that morning, all of which will be available to see on my Facebook fan page later today; so yeah, don't think that this is all! However, to get some live action news going on too, I put together a video with the footage he got that morning (yeah I don't know anything about video editing...haha). I hope you enjoy it! 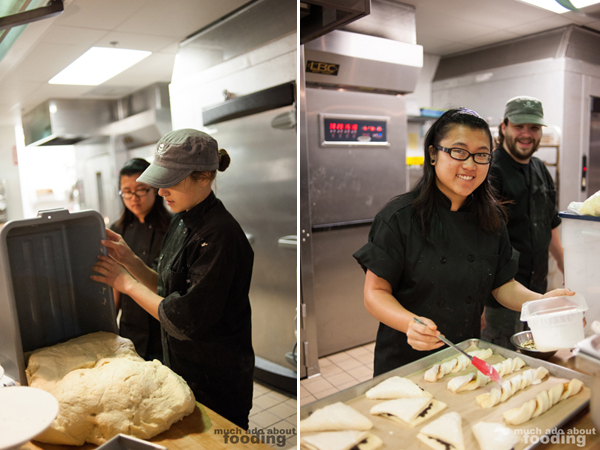 Thank you once again to Chef Rachel and all her crew at the bounteous, beautiful, and badass Blackmarket Bakery!